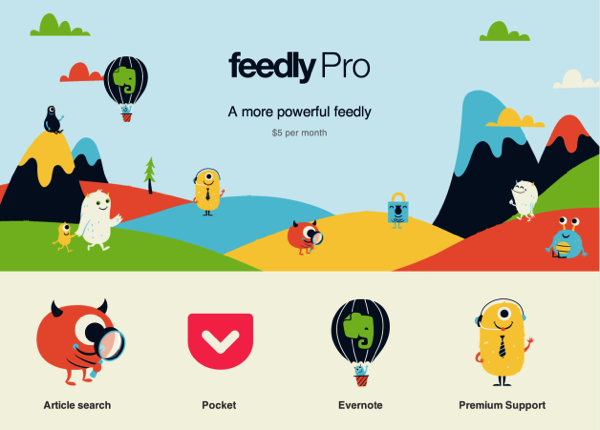 We are excited to announce that feedly pro is now generally available. For $5 per month or $45 per year, you can get access to the first batch of pro features: search, one-click Evernote integration, one-click Pocket integration, and premium customer support. Feedly says the capital raised by Pro users will allow them to become more innovative with both standard and Pro versions of the service, plus help invest in infrastructure and customer support. Back in June, Feedly launched its cloud solution to replace Google Reader and said their new infrastructure could handle processing up to 100 million feeds and billions of articles published daily.